OHSWEKEN - McMaster University's board of governors may have its first traditional chief as a member. Jake Thomas, a Six Nations Confederacy chief, recently attended his first board meeting. He accepted a four-year appointment this summer. "I don't know if any native person from Six Nations has ever been on there," he said. The university is developing a native studies program. Mr. Thomas hopes he can offer some guidance. "I guess there's a lot there that they want the students to learn and maybe they want me to steer them in the right direction. This is an opportunity for myself, as well as for the students to learn something about themselves." The traditional Cayuga chief said he might be willing to teach part-time at the university. 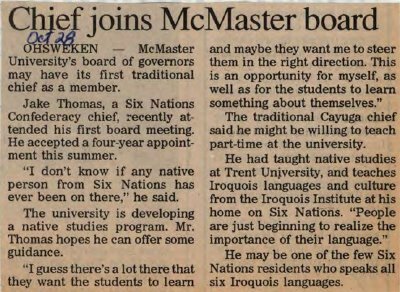 He had taught native studies at Trent University, and teaches Iroquois languages and culture from the Iroquois Institute at his home on Six Nations "People are just beginning to realize the importance of their language." He may be one of the few Six Nations residents who speaks all six Iroquois languages. Haudenosaunee Confederacy Chiefs Council ; Trent University.